UPDATE: Ollie is very fragile at this time - he can even experience a seizure when stressed. He should only go to a home with a relatively quiet atmosphere. He does get along well with other budgies. Hi, I`m Ollie. 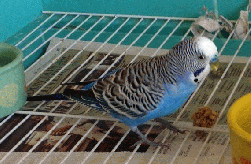 I`m a boy budgie who is very personable and interactive. If you walk into the room & don`t greet me, I will get louder and louder until you acknowledge me! I am very good at budgering (the gurgling budgie noises that can go on all day). I come with a swing, which is MINE alone. I have, sadly, experienced a couple of seizures, so I will need some attentive care from my new home.